This page was updated at 1:50 p.m. ET, Sept. 27. A dead NASA satellite, called the Upper Atmosphere Research Satellite (UARS), is falling uncontrolled toward Earth and crash in the Pacific Ocean on Saturday, Sept. 24. Agency officials are unable to pinpoint the exact time and location of the fall, but have said there is little risk of debris landing in populated areas. SPACE.com is providing full coverage of the UARS re-entry, including a look at the issues surrounding orbital debris and space situational awareness. "NASA's decommissioned Upper Atmosphere Research Satellite fell back to Earth at 12:01 a.m. EDT (0401 GMT) on Saturday, Sept. 24. The Joint Space Operations Center at Vandenberg Air Force Base in California has determined the satellite entered the atmosphere over the Pacific Ocean at 14.1 degrees south latitude and 189.8 degrees east longitude (170.2 west longitude). This location is over a broad, remote ocean area in the Southern Hemisphere, far from any major land mass. The debris field is located between 300 miles and 800 miles downrange, or generally northeast of the re-entry point. NASA is not aware of any possible debris sightings from this geographic area. This is your source for official information on the re-entry of UARS. All information posted here has been verified with a government or law enforcement agency. This is NASA's final status report on the re-entry of UARS." Video: Raining Satellite Debris: How Worried Should You Be? A falling NASA satellite caught the interest of skywatchers and pranksters alike. It's harder than you think to determine where a piece of space junk falls. NASA's doomed Upper Atmosphere Research Satellite fell to Earth today. A new prediction suggests SoCal residents could see the UARS satellite's fall to Earth. NASA's UARS satellite is expected to fall to Earth by Saturday(Sept. 24). The FAA wants pilots to report any space debris sightings from NASA's UARS satellite. 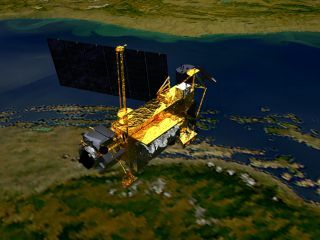 NASA's Upper Atmosphere Research Satellite (UARS) is falling to Earth, and may crash on land. We wondered who would have to pay for repairs if it landed on a house. NASA's 6-ton Upper Atmosphere Research Satellite (UARS) is expected to fall back to Earth late tonight or early Saturday (Sept. 23 or Sept. 24 EDT), raining more than two dozen large chunks of debris on the surface. But don't even think about keeping a piece for yourself. Those worried about the falling satellite headed toward Earth can monitor its location with an Android app. SPACE.com talks to an orbital debris expert about the falling UARS satellite and the problem of junk in space. North America is safe from the uncontrolled fall of NASA's UARS satellite, officials say. Where On Earth Will NASA's Doomed Satellite Fall? Scientists won't be able to determine where pieces of the UARS satellite will fall until two hours before impact. So what's the chance that you, reader, will be struck by some piece of former space flotsam in your lifetime? NASA's falling UARS satellite could offer a unique skywatching opportunity for anyone lucky enough to see it. NASA's Upper Atmosphere Research Satellite is expected to fall to the ground on Sept. 23. An out-of-control satellite that's been languishing in orbit for six years is now one the verge of falling back to Earth, NASA has announced. Video: Where Could UARS Satellite Debris Fall? A dead NASA satellite the size of school bus is falling back to Earth, and where it will drop no one knows, at least not yet. The space agency is clear, however, on where the satellite's debris will not end up: eBay. An out-of-control NASA satellite that is dead in space will plunge back to Earth in the next few weeks, but exactly when and where the spacecraft will fall are still a mystery, space agency and military officials said today.